New York is a city for and of pizza lovers. 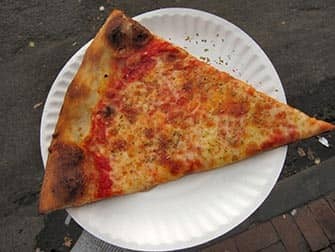 Every New Yorker has a favourite address to get a slice or ‘pie’ (the whole pizza), but a couple of pizzerias have almost been declared holy spots for dining. Here is a top 5 of the best pizzas that you will ever taste. 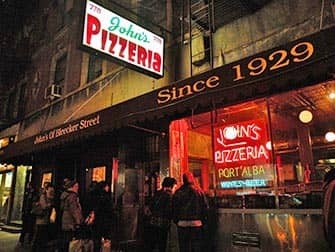 John’s Pizzeria of Bleecker Street (or just John’s Pizza). 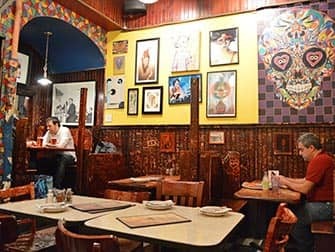 The wood panelling, traditional niches and colourful wall art make this restaurant an experience in itself – free with your slice of pizza. You will see many hip people, artists without money, old Italian gentlemen from the neighbourhood and a lot of celebrities (at least on the wall). You cannot buy slices here, only a whole pizza. And this you can then easily share with two or three people. The pizzas are made in a brick oven, giving them a dark crispy thin crust. 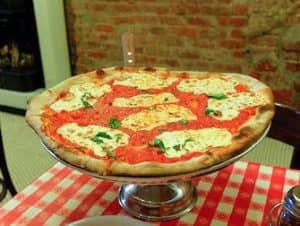 John’s Pizza praises itself for the classical Neapolitan preparation of their pizzas. And rightly so, these pizzas are more sophisticated than most American-Italian variants. The ingredients are fresh, the sauce spicy and the cheese of premium quality. The cheese pizza is standard here, but there are countless possibilities of different toppings. A nice touch is that you can also order a lovely bottle of wine for a nice price. And you won’t go bankrupt: $17.00 plus $4 per topping. There is also establishment on Times Square, both locations are great for lunch and dinner but expect a queue. This pizzeria is actually located in a bit of a weird, or at least unexpected place in Manhattan. You wouldn’t expect for one of the best pizzerias to be located next to Penn Station. I only know about it because I read about a boy who tried out all of the pizzerias in Manhattan during the course of two years. NY Pizza Suprema received a great score, so when I last had the chance to try it myself, I of course did. And? Well, he was right! The pizzas have a good crust and are perfectly lightly baked. But it’s the sauce that makes the pizza, and that’s fantastic. It’s tasty, spicy – but not too spicy. The sauce is really what makes the difference. Try at least one margarita slice before you go crazy with, for example, pepperoni. Even though there is enough seating, this is not a place you go to for the atmosphere, but purely for the pizza (from $24 for a pie or from $3 a slice). In terms of slices, this place is the winner (John’s Pizza doesn’t offer slices). This is a great place for lunch or, because of its location near Penn Station/Madison Square Garden, perfect for grabbing a snack before or after a Knicks or Rangers game for example! For a slice of history, you’ll need to visit Lombardi’s. 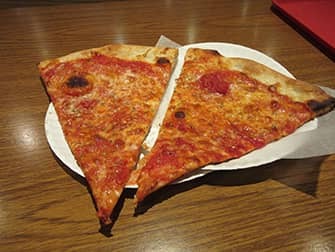 In contrast to Joe’s Pizza, Lombardi’s is not designed for a quick bite to eat. 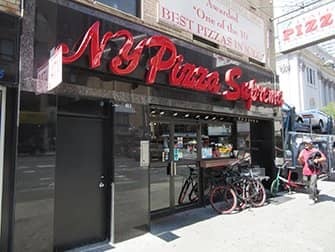 In 1905 this pizzeria was given permission to establish themselves by the municipality of New York making it the oldest pizzeria in the city. The décor has changed little since then: wooden tables, red and white chequered tablecloths and murals of the Italian countryside. Everyone comes to Lombardi’s – from a glamorous couple to a large family. In the restaurant you cannot order slices but only whole pizzas, and these aren’t for those on a diet! Lombardi’s is known as the pizzeria that introduced the New York style pizza. This is a pizza with a thicker dark crust, topped with mozzarella, tomato sauce and basil. On top of that you can choose lots of different sorts of meats, including home-made meatballs. Toppings are $3 a piece and the pizzas are $22.50 (8 slices) or $18.50 (6 slices). Great for lunch and dinner but expect a long queue. Finding Joe’s Pizza from the subway stop West 4th Street is easy; just follow the sounds and smells! This place is always packed with businessmen, residents and workmen eagerly enjoying their slices. 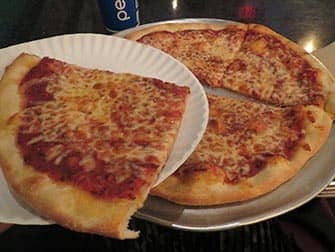 You can order one of those slices at the ‘bar’, where you’ll be handed a paper plate with your selection that you can devourer straight away at one of the standing tables on the side. The trouble will surely be rewarded as the pizzas are topped to perfection and very good. You can order a cheese pizza, a margarita (with mozzarella) or a Sicilian. All of the different pizzas have a thin crispy crust and a large amount of cheese. For most, the high point is Joe’s tomato sauce: the right balance between sweet and spicy. You can also add a range of toppings, like pepperoni. You pay a little extra for that, but at $2.75 a slice, that isn’t a big deal. And who knows, you might be rubbing elbows with Leonardo DiCaprio, who frequents Joe’s. 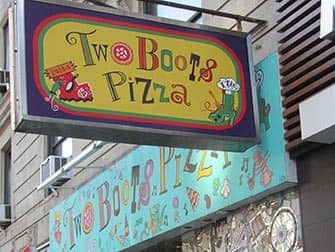 Two Boots was established in 1987 by two film-makers that love pizza and beer (like many American men). The name references the form of both Italy and Louisiana as they both look like boots. With an original name and creative entrepreneurs, it’s no wonder that Two Boots serves special pizzas. At all locations (11 in New York) you can order a cheese pizza that can be dressed up with toppings inspired by Southern food. The names of the pizzas are inspired by films and tv shows: The Dude, The Newman, Mr Pink and Cleopatra Jones. Whomever doesn’t feel like an exotic pizza can just choose pepperoni, anchovies or olives. A slice costs $2.75 – $3.75 and a pizza costs $9.95 (small), $14.95 (medium) or $19.95 (large).